Our group of table desks and computer desks has something for everyone. Different styles, sizes, and finishes are available to suit every taste and meet your needs. Ample storage options, excellent functional features, and sophisticated style come together. 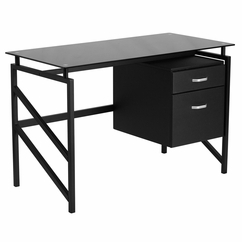 From compact laptop table on wheels, to large office desks, this collection has a desk that you will love. Enjoy comfortable computing and working from home, with one of these cool desks. All Desks ship FREE to the continental U.S., usually in 3-4 business days!